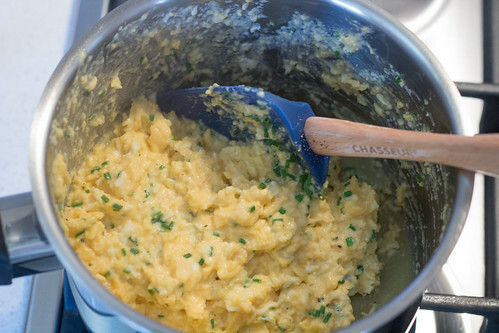 I came across Gordon Ramsay’s way of cooking scrambled eggs and after doing it once. I simply can’t go back to the old way of cooking scrambled eggs. These are “wetter” but retains the egginess of it all, plus has the slight richness of the butter and cream. It’s also very quick to cook, it just requires a bit more hands on cooking. 1. Break the eggs into a cold, heavy-based pan, place on the lowest heat possible, and add half the butter. 2. 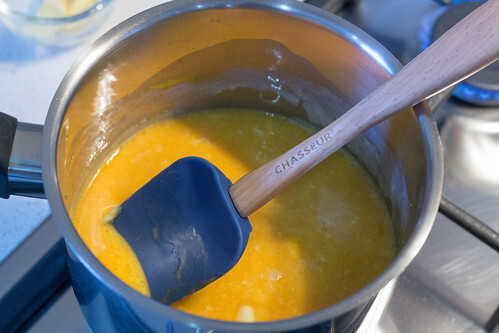 Using a spatula, stir the eggs frequently to combine the yolks with the whites. 3. 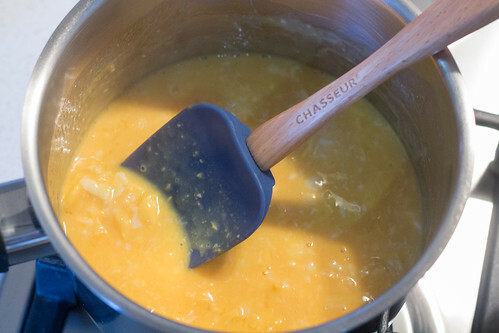 As the mixture begins to set, add the remaining butter (and thickened cream if not using crème fraîche). 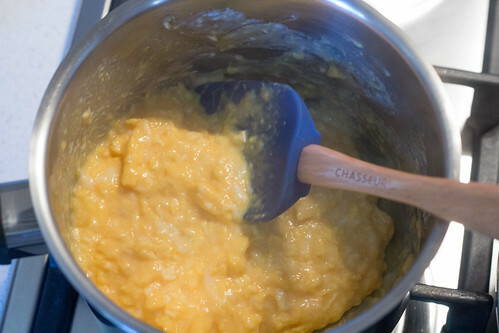 The eggs will take about 4-5 minutes to scramble – they should still be soft and quite lumpy. Don’t let them get too hot – keep moving the pan off and back on the heat (as the bottom of the pan stays heated even after taking it off of the stove). 4. Add the crème fraîche and season the eggs with salt and pepper at the last minute, then add the snipped chives and serve immediately. 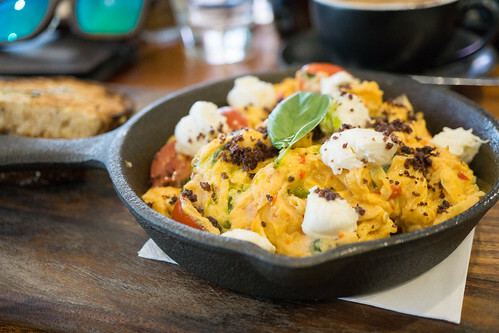 A delicious way to cook scrambled eggs. 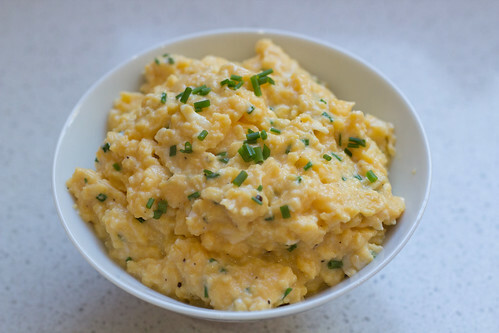 The freshness of chives, and creaminess of scrambled eggs and yet retains the wonderful flavour of eggs. Break the eggs into a cold, heavy-based pan, place on the lowest heat possible, and add half the butter. 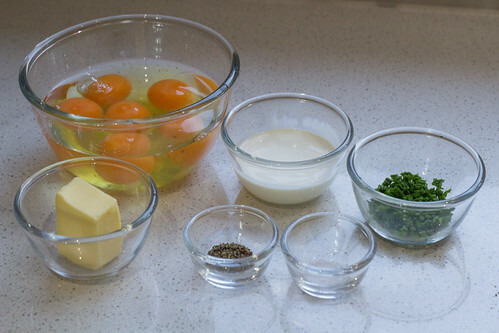 Using a spatula, stir the eggs frequently to combine the yolks with the whites. 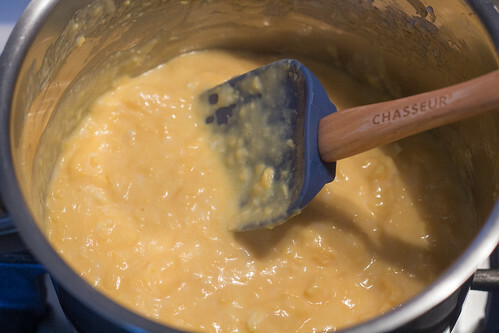 As the mixture begins to set, add the remaining butter (and thickened cream if not using crème fraîche). 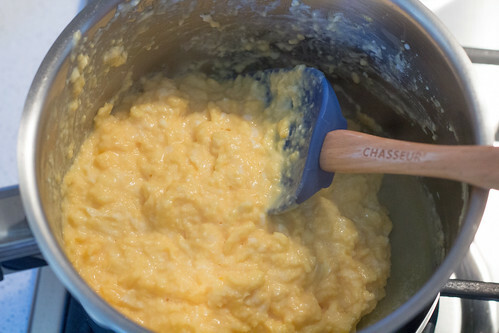 The eggs will take about 4-5 minutes to scramble – they should still be soft and quite lumpy. Don’t let them get too hot – keep moving the pan off and back on the heat (as the bottom of the pan stays heated even after taking it off of the stove). Add the crème fraîche and season the eggs with salt and pepper at the last minute, then add the snipped chives and serve immediately. 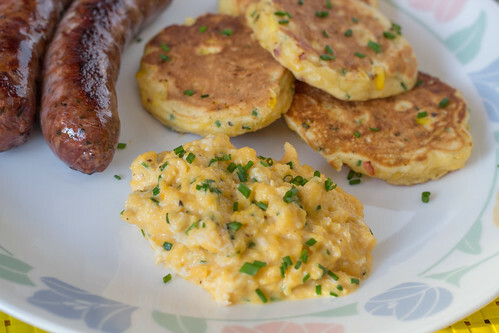 If you're substituting the crème fraîche, add the thickened cream just as the eggs start to set. 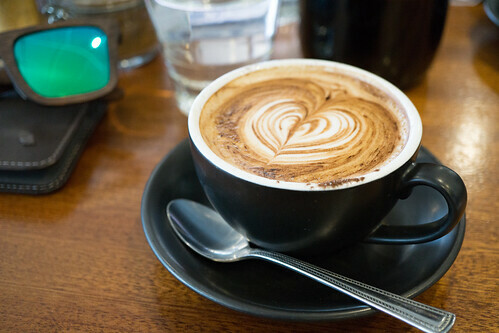 Milk can also be used with thickened cream for lighter tasting eggs. Cook with Gordon Ramsay, if that's your thing. I had never been to an IHOP before (aka International House of Pancakes) which primarily serves breakfast dishes and it’s quite a large chain in America so presumably they would have decent food, right? Well lets take a look as we dined at their Niagara Falls location (Ontario, Canada side FYI). I love Belgian Waffles, and if they are done right it’s down right amazing. I love waffles that are crispy on the outside but ever so soft and light inside, and just with a bit of butter or cream to give it a bit of richness. Wonderful just fresh. 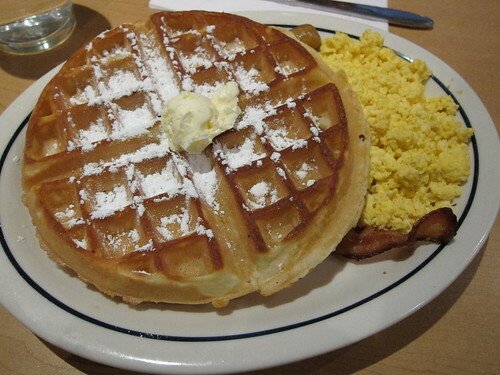 IHOP’s waffles were a bit of a disappointment, luke warm and just bland. The Belgian Waffle Combo comes with your choice of two eggs, and either bacon strips or pork sausages. Being the indecisive one, I ordered one pork sausage and one bacon strip and just topped with whipped butter and icing sugar but you can choose strawberry toppings, blueberry or cinnamon apple compote too. The scrambled eggs were incredibly bland, it didn’t even taste like eggs to be quite honest. I never knew eggs could be done so wrong but there you go. The bacon strip was dry and hard, so noticeable over-fried. 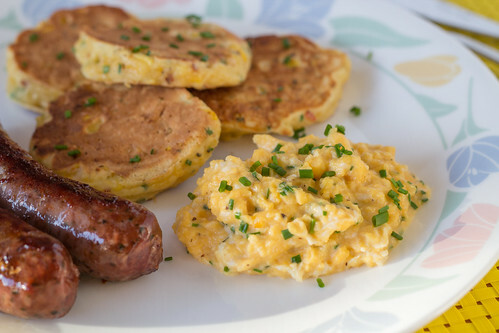 The pork sausage also lacked in flavour but not as disastrous as the eggs of bacon. For the price you’re paying too, I wouldn’t recommend it. 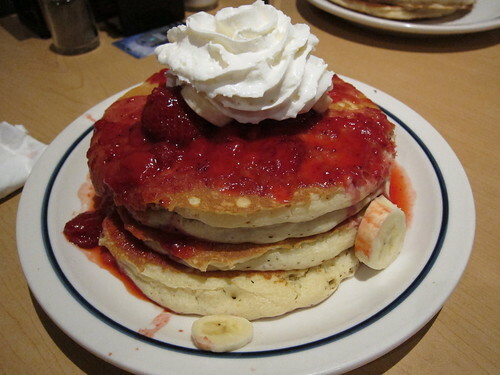 IHOP’s Strawberry Banana Pancakes looked great! The pancakes were fluffy although a bit bland which I guess the strawberries, whipped cream and bananas are for. Overall, nothing to run home about or Tweet about. 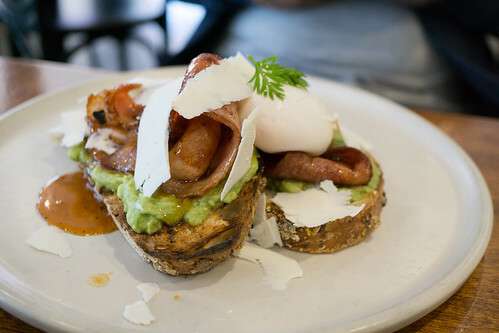 For a place that supposedly is known for their breakfast foods, it isn’t very good at all. I’d probably have a more enjoyable meal by buying a Sausage and Egg McMuffin and with money in the pocket.